Is it too early to start making a Christmas list? 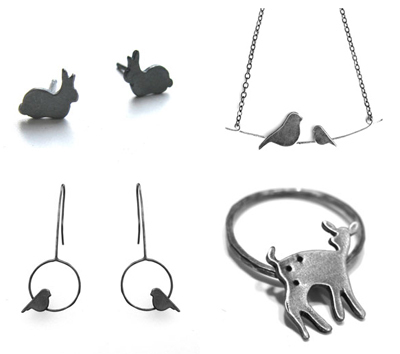 I love all these pieces from Figs and Ginger: Eco-friendly metal-smithing inspired by forests. The jewelry is unbelievably cute and made as an eco-friendly business. These are my favorite items. The fawn on the ring is attached so it "flutters about". Adorable! I just got the deer earrings and I wear them all the time! Love that shop! you should come to this year's boston bazaar bizarre - figs and ginger will be one of our vendors! It's never too early to start making a Christmas list! These pieces are adorable. i just added All Wired Up jewelry http://www.allwiredupjewelry.com to my wish list. It's a husband and wife who hand make all of their eco-friendly pieces.